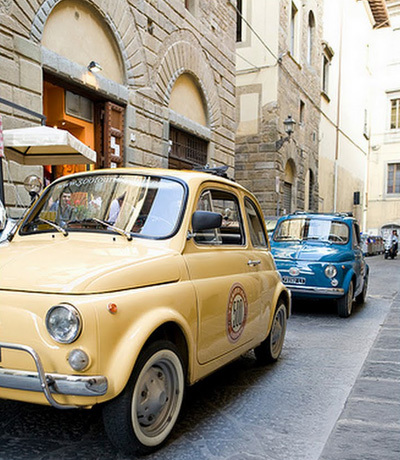 The Fiat ‘Bambino’ is a motoring icon and forever linked with ‘la Dolce Vita’. 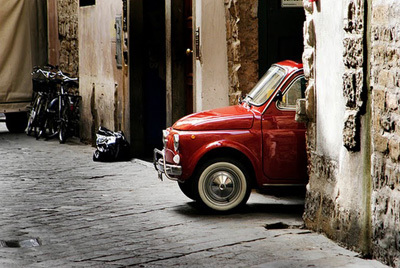 As Italian as a Vespa scooter, this cute little car will bring a smile to everyone’s face. We have a fleet of 25 of these classic 1950s and 60s cars which will be all yours for the day. 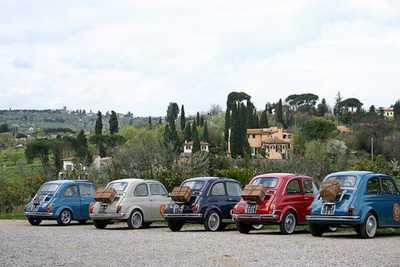 Issued with your Italian Job packs it’s off along the cobbled and ancient Appian Way. In a few minutes you are out into the countryside and rolling along the rural roads. The route takes in the small villages of this delightfully scenic part of the Roman Lazio region. Up hills, along valleys and around lakes with stops at checkpoints along the way to complete team and individual challenges. Lunch is taken at a local restaurant overlooking one of the volcanic lakes before the Italian Job continues towards the famous wine growing Frascati region. The event ends at vineyards for a wine tasting competition and dinner plus the announcement of the winners. A transfer takes the group back Rome and the overnight hotel. The 4 star hotel in the centre of Rome is beautifully placed for you to explore this most fascinating city where ancient ruins nestle against contemporary design, classic cafes allow you to watch the world go by before heading off for some of the best fashion shopping in Italy. Dare we say this is an excellent and different way to experience Rome.